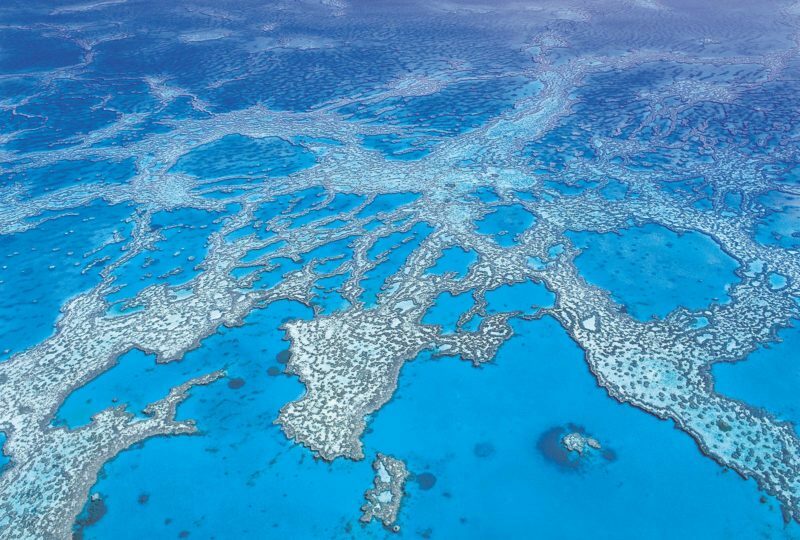 Palm Bay is accessible by water taxi from Shute Harbour or Hamilton Island. Their unique concept of self catering gives flexibility and freedom to their guests. They also do all the cleaning up for you. Their gorgeous dining room is set up for you and there is the option of bringing in caterers for groups or special occasions. 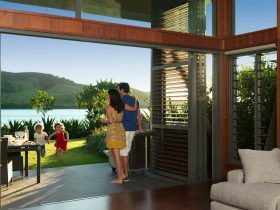 Offering complete tranquillity and seclusion, Palm Bay has been designed to intricately blend into its natural surroundings and is a stones throw from some of Australia’s most iconic reefs and beaches. 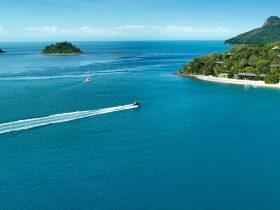 Catering for those seeking the unique seclusion of an exclusive, intimate resort, they look forward to creating your next Whitsunday experience and welcome you to Palm Bay. Palm Bay is also an ideal location for groups of up to 50 or special events, weddings and corporate functions. Beautifully designed Balinese Inspired with garden frontage and filtered sea views The bure accommodates two people. Each bure has an ensuite and private deck with hammock. Divine and private with elevated views through the coconut palms the Hibiscus suites offer the ultimate private excape for those seeking an intimate romantic experience. Featuring private sun deck and additional balcony, lounge with entertainment unit, Queen size bedroom with spacious en suite and kitchenette, the Hibiscus suite is for those looking for the tranquility and seclusion of your very own private retreat. The luxurious one bedroom self contained bungalows include a separate lounge and dining area and can accommodate two to four adults in either one king or twin single bed configurations. Each bungalow is complete with ensuite, walk in wardrobe and private deck with hammock. Absolute beachfront, the bungalows offer the perfect relaxation experience. Bedding is for two persons only. Extra bedding attracts an additional charge. The ultimate in luxury resort accommodation; Platinum house is ideal for an exclusive romantic getaway, travelling families with older children, girls getaways, and wedding accommodation. Boasting a king size master bedroom with sunroom, large flat screen television, ensuite and bar fridge plus a second queen sized bedroom with an additional sun room for private relaxation. Platinum House has a fully equipped modern kitchen, dining and lounge area with television, DVD player and stereo plus a separate laundry and guest bathroom. 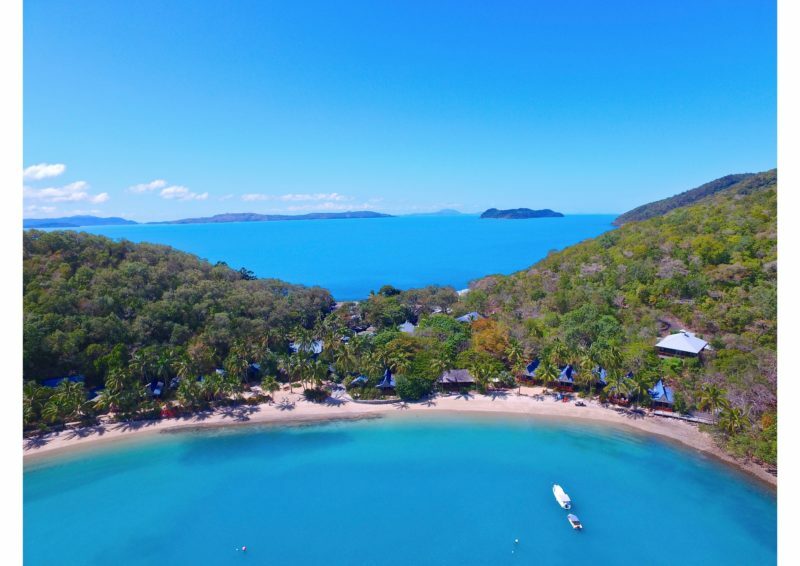 Perched at the top of a hill overlooking the crystal blue waters of the Coral Sea below you will be able to enjoy the wonderful views from your very own private expansive deck as you relax on the large wooden outdoor entertaining and dining area. Beautifully designed Balinese Inspired with Ocean and frontage, the bure has a separate ensuite and private deck with hammock. Listening to the sound of the ocean lapping on the shore. The beach front villas can accommodate two people. The bed configuration is one queen size bed. 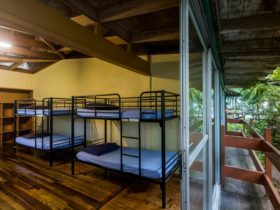 Each cabin is complete with ensuite and private deck with hammock. Our two bedroom beachfront bungalow is absolute beachfront. With a large deck and two bedrooms the bungalow is ideal for two couples or a family. One bedroom has a queen bed and the second bedroom is two singles. Featuring a kitchenette and separate lounge/dining area there is plenty of room. With views to the northwest you will enjoy magical sunsets from your balcony. 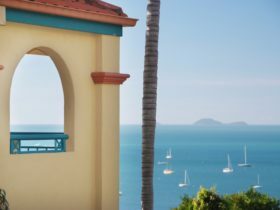 Elevated to capture the view of the Coral Sea the Ocean View is our most private room with secluded balcony. Ideal for honeymooners and those who value their privacy this room is tranquil and spacious. Rollaway bedding is available in the bungalows only and attracts an extra charge of AUD40 per night. One night stays attract a surcharge of AUD100.